Sensei Ramathas is very dedicated to Karate and teaching. He started to learn Karate (Shotokan Style) in 1989 from Sensei Thangarajah, in Sri Lanka. Unfortunately he had to take a break from Karate due to his migration to UK. In 1994 he started to learn Karate (Shotokan Style) from Sensei Morrison, in Peckam, London again. From the year 1997, he started to learn and practice Isshin Ryu Karate and he achieved his first degree black belt in Isshin Ryu in the year 2003. 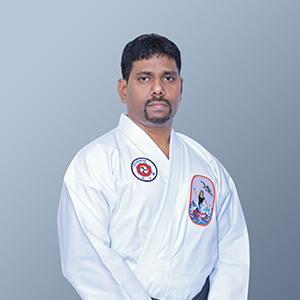 Sensei Ramathas is the first member of Isshin-Ryu World Karate Association, from United Kingdom and he has got trained under the great Sensei Michael Calandra, 8th Dan, Kyoshi Go I.W.K.A in the USA. Sensei Ramathas founded his club, Goshin Isshin Ryu Karate in 2007, and has been running it very successfully to date. Through the years, GIKA has grown leaps and bounds with more than 1000 students having been trained, 10 branches within The United Kingdom, 11 branches in Sri Lanka and also now expanding into India. In addition, Ramathas is a good marathon runner, athlete, athlete event organiser and founder of Tamil Youth Sports Club (TYSC), and has a great interest in Foot-ball and has been coaching it for a while too. Ramathas is an instructor who provides equal opportunities, has no bias, expects well discipline from his students, a very strict instructor but at the same time makes his students laugh by his humorous talk to reduce the gap between him and his students to ease learning process for his students. He is very compassionate about his students’ growth in Martial art as well as their social and academic life.